Apart from being our most popular ski resort, Bansko is a town where the traditions are an important part of people’s lives. The proud mountaineers keep the traditions of Bansko alive, they pass them on from generation to generation, and they gladly share them with the town’s guests. To list all the traditional holidays that people of Bansko celebrate would be a bit difficult, because from the first day of the New Year to Dimitrovden there are at least several big holidays, but we will try to introduce you to some of the most loved celebrations by the people of Bansko. The first day of the New Year in Bansko begins with chasing away the evil forces. The custom Kukeri comes from ancient times and symbolizes the retreat of winter and onset of spring. In order to „open” the way to the good, the kukeri dress in scary costumes of animal skin, put on ominous masks and perform combat dances in which the chanove that are attached to their waist make loud sounds. The scary masks and loud noise they make have the purpose to chase away the evil spirits, and to bring fertility and grace to every family in the town. Traditionally, in the Kukeri carnival participate only men who represent separate neighborhoods of the town. Each group has a King, Pope, Bride (Grandma) and Bridegroom (Grandpa). 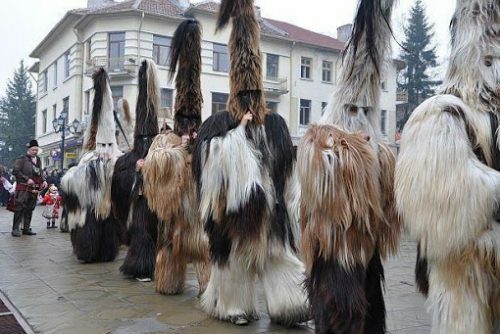 In the past, the kukeri who are called „babugeri” in Bansko, have walked from house to house, entered in every yard to chase away the evil and performed their dances intended to bring fertility and happiness to the owners. They smeared the chicks of the small children with ash for health, as the owners of the houses gave them food for the road. Today, the traditions of Bansko are alive and every year begins with a kukeri carnival, which starts from the neighborhoods of the town and ends in the center of Bansko, where the babugeri meet and perform an ancient fertility ritual. The Kukeri carnival is one of the most interesting winter attractions in Bansko, and thousands of tourists come to the town every year to watch the carnival. Easter is a holiday that is celebrated by all Christians in the world, and of course, in Bansko, eggs are dyed, Easter cake is baked and the Resurrection of Christ is celebrated. Besides the familiar customs according to which we celebrate Easter, however, there is another tradition in Bansko that is passed on from father to son for generations. An ancient game called „lomada” was performed during the Easter celebrations. The legends tell that this game was created by the Roman soldiers who, in order not to fall asleep as they guarded the body of Jesus Christ, started to fill their time by throwing stones. „Lomada” is played in Bansko from ancient times to the present day, as the tradition is passed on to every next generation. Only men are allowed to participate in the game, as they compete to throw stones, as close as possible, to the wooden stakes located at the end of game field. In the ancient times when the game was played, women weren’t allowed to even watch. Nowadays the tradition has changed a bit and anyone who wants to experience the unique Easter custom in Bansko, can attend the game. In Bansko, St. George’s day is celebrated for three days with various cultural events, culinary exhibitions and interesting folklore program. In recent years, a very old ritual has been revived in the region, and it is called „Soaking of flower”. The ritual is performed only by young, unmarried girls. During the night before St. George’s day (05.05), the girls dressed in folk costumes, put marked flowers in a large bowl with water. The bowl is left outside for the night under a rose bush, and it is guarded during the entire night in order to prevent from being stolen by the bachelors. The next day, the bowl with the marked flowers is brought to the square and a little girl takes out each flower and makes a spell for health and love. In the past, this ritual helped the girls find out what kind of young man they would marry and whether they would marry soon. The revival of this spell ritual in Bansko, Dobrinishte and Razlog is another proof that the traditions of Bansko won’t be forgotten and that they are going to be celebrated in the future. The idea of celebrating the holidays of Bansko comes from the National Revival period, when the town was famous for its countless masters leather-workers, icon-painters, carpenters, fullers, saddle-makers, blacksmith. The crafts have always been respected in Bansko and to the present day there are families in which a particular craft is passed on from father to son. The days in which the traditional holidays of Bansko are celebrated are at the beginning of the summer season in Bansko. Every year from May 17 to May 24 in the resort town can be visited different landmarks, themed dinners, exhibitions, competitions, exhibitions of works of the masters of Bansko and others. During the celebrations of the traditions of Bansko the entire town becomes one incredible faery of music, entertainment and dancing under the ski. The celebrations have been organized for three decades and they are intended to present at one place all traditional for the region cuisine, crafts, music and dances. The culmination of the celebrations is the opening of the culinary exhibition where people of Bansko present unique, traditional dishes of the cuisine of Bansko. The holidays end on May 24 with a traditional parade in honor of the Day of the Slavic literature, culture and enlightenment. 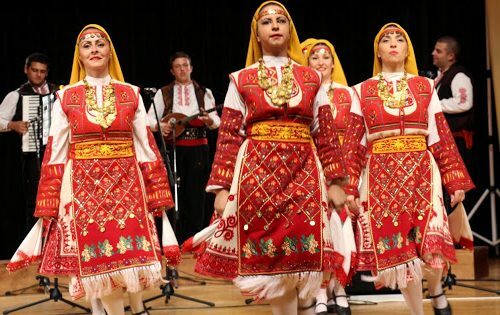 During the days of the traditions of Bansko, there is also a folklore festival called „Among Three Mountains”, where amateurs from several towns in the region of Rila, Pirin and Rhodope mountain are participating. The beginning of the already traditional for Bansko Jazz Festival was initiated in 1998 and was initially organized for the guests in the clinic of Dr. Emil Iliev. It started as a modest musical event for a limited circle of people, but very soon the jazz music gone beyond the area of the clinic and became an International Jazz Festival, which every year welcomes local and world-famous jazz celebrities. Today, the people of Bansko are proud of the fact that their town is a place where so many jazz performers gather every year. The cuisine of Bansko is distinctive, unique and delicious, and undoubtedly popular throughout Bulgaria. But its real taste can be felt only here, in Bansko, where every family has its own recipe for the preparation of banski starec, chomlek, beet, kapama, kukurini, bustard, shupla and other dishes with funny names. People of Bansko guard jealously their cooking secrets, but they don’t mind feeding the town’s guests with their dishes. That is why every year, in the last Saturday of May, a Celebration of the cuisine of Bansko is organized in the town, where every housewife, restaurant or tavern in the town present their dishes. The date on which the people of Bansko celebrate their town’s celebration was not chosen by accident. 106 years ago, on that date Bansko was liberated from the Ottoman rule. The town is the first settlement in the Pirin region, which obtained its independence, and even more interestingly, it got liberated completely on its own. On 05.10.1912 the detachment of Hristo Chernopeev entered Bansko and the bells of the „Saint Trinity” church invited the population to gather in the temple. In the church, before all people of the town, the famous poet Peyo Yavorov pronounced deep speech, ending with the words: „Down with the fez, Bulgarians, you are free now!”. Since then to the present day Bansko honors its celebration on this memorable date. Traditionally, the holiday of the town starts with the sounds of the bells of the „Saint Trinity” church and a solemn liturgy. Various competitions are held throughout the entire day in Bansko, and crafts are presented which are traditional for the town and region, people welcome guests and serve a delicious banitza with rice. The town’s celebration traditionally ends with a big outdoor concert featuring popular Bulgarian singers. One of the biggest events in Bansko is of course the opening of the ski season in the resort. Every year in the middle of December, there is a passionate preparation for the beginning of the new ski season. The event has been officially organized for more than 20 years, and there are famous athletes and ski legends from around the world as guests. The opening of the ski season is an event that is expected by the people of Bansko with great impatience, and it has found its place a long time ago, alongside the abovementioned guarded jealously traditions of Bansko. 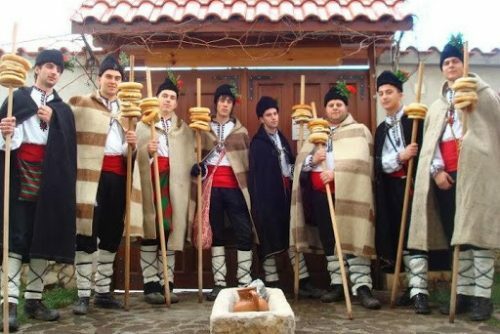 The Koledari is an old Bulgarian tradition, which is still honored in Bansko. During the Christmas night, young men dressed in folk costumes, gather and go from home to home in the entire town of Bansko. The tradition demands the Koledari first to give blessings to the house of the most important person in the town and then to enter every other home to bless it. The young men sing songs, make spells for health, fertility and wealth, and the owners give them homemade baked ring-shaped bun, bread, wine, local delicacies, beans, money. After blessing every home in Bansko, the Koledari gather at a table to eat and drink for everyone’s health. In Bansko, the preparation for the Koledari starts on December 20th. Then men gather together to prepare their folk costumes, to sing Christmas songs and to decorate their hats with flowers and popcorn. Unlike many towns and villages in the country where the Koledari is not celebrated anymore, in Bansko the tradition is alive and it is passed on from generation to generation.